How Do I Balance My Adoptive And Birth Parent Relationships? Balance is a myth. I know that it may sound crazy since we gear so much in our lives towards finding that “perfect balance.” However, I have found that there is not such a thing. Yet, we drive ourselves crazy trying to achieve it. In the end, someone always feels shorted. Some area in our life always seems like it is not enough. When it comes to relationships, it often feels there is simply not enough time in the day and no way to please everyone. It is by realizing that we cannot achieve a balance that we learn to seek more realistic standards for ourselves and others. My husband will often come home from work feeling drained. As I do most of my work during the night, he hangs out with our 5 children, and we attempt to steal a moment with each other here and there. It often seems like Groundhog Day. So many relationships need attention, and there is just not enough time. For myself, I work into the night, try to grab at least a few hours of sleep only to wake up, clean, homeschool, prepare meals, and do it all over again. There is not a day that goes by that my husband or I do not feel we have not failed one of our relationships that day, whether it be with those at work, our kids, or each other. Balancing relationships within any family can be difficult. In adoption, this may become exceedingly difficult when various emotions and factors come into play. The timing of adoption reunions and the circumstances regarding the adoption can also affect relationships, hindering this balance even further. It is important to recognize what balance truly means and how to tackle each relationship as an individual relationship. 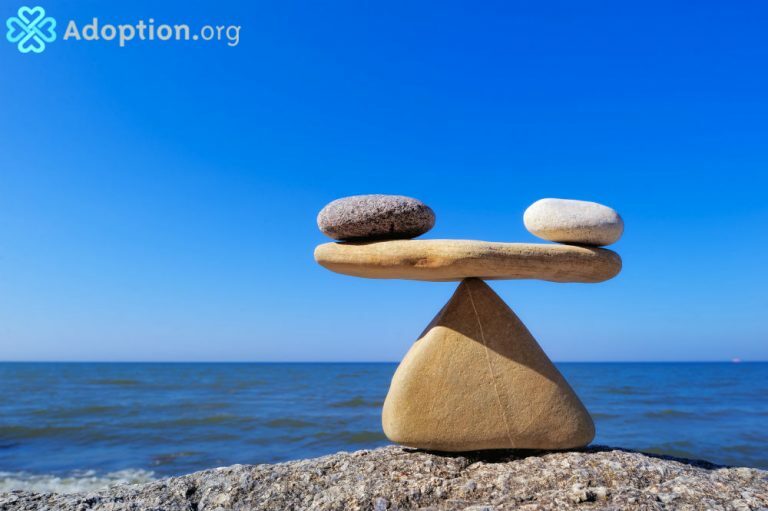 Balance means setting emotions aside and setting realistic expectations for yourself and others. There is one key point to remember when trying to juggle your birth and adoptive parents relationships. It is vital to remind yourself that “all you can do is all you can do.” This is a phrase I often tell my husband. People will always want more of you. It is simply human nature. You cannot please everyone. The only thing you can do is set priorities and try to do all you can to fulfill them. If it is important for you to get to know your birth parent and build those relationships for a time, that is a need your adoptive family will have to understand. It is not your responsibility to repair their pride or jealousy if that becomes an issue for either birth or adoptive parents. Any attempt at balancing these relationships will be more like a give and take. This will be, and flow, based on the needs and situations that are present at that time. You can reassure your birth and adoptive family of their importance in your life, but it will be up to you to decide how your time is divided. Your focus at a given time does not negate the importance of other relationships. All you can do is all you can do, and a balance will look like peace for you and confidence that you are where you need to be at any given time; therefore, if you do not feel that peace and confidence, take a look at your time management and focus and see if anything needs shifting. Lita Jordan is a master of all things “home.” A work-from-home, stay-at-home, homeschooling mother of five. She has a BA in Youth Ministry from Spring Arbor University. She is married to the “other Michael Jordan” and lives on coffee and its unrealistic promises of productivity. Lita enjoys playing guitar and long trips to Target. Follow her on https://www.facebook.com/halfemptymom.